Back in December of last year (how long ago the busy months intervening have already made that seem! ), my post for this site gave a preview of the special issues and events coming up in celebration of EQMM’s 75th anniversary. We’re now more than halfway through release of the year’s special issues, and all of the remaining issues are in some stage of production. July 2016, composed entirely of stories by authors who got their start in EQMM’s Department of First Stories, is on sale now, and on the nineteenth of this month, our August issue, a tribute to EQMM’s former editors, brings back from our archives Eleanor Sullivan’s Edgar-nominated story “Ted Bundy’s Father” and a new story by Edgar-winning playwright Joseph Goodrich in which Frederic Dannay and Dashiell Hammett take center stage. Our designated anniversary issue, September/October, will bring together new stories by four Grand Masters of the MWA, six EQMM Readers Award winners, several Edgar Award winners, and a number of authors whose books regularly appear on the New York Times best-seller list. Authors include Joyce Carol Oates, Jeffery Deaver, Linda Barnes, Peter Lovesey, Bill Pronzini, Marcia Muller, Charlaine Harris, Peter Robinson, Margaret Maron, Jon L. Breen, David Dean, Tim L. Williams, Doug Allyn, and Dave Zeltserman. Also featured in the fiction lineup are one of the most famous mystery short stories of all time, Stanley Ellin’s “The Specialty of the House” (from our archives) and, of course, a new entry for our Department of First Stories. Special nonfiction articles describe both the literary world and the wider world into which EQMM was born and reveal hitherto unknown details of the original publisher-editor negotiations concerning the magazine. All of this rich content, plus our monthly review columns, is packed behind a stunning cover designed by one of America’s most influential graphic designers, Milton Glaser—who got his start, back in 1954, with a cover for EQMM. Also not to be missed is November 2016, which celebrates the magazine’s long critical tradition with articles by award-winning reviewer Jon L. Breen and mystery scholar Martin Edwards, and fiction from our archives by one of EQMM’s early reviewers, Anthony Boucher. 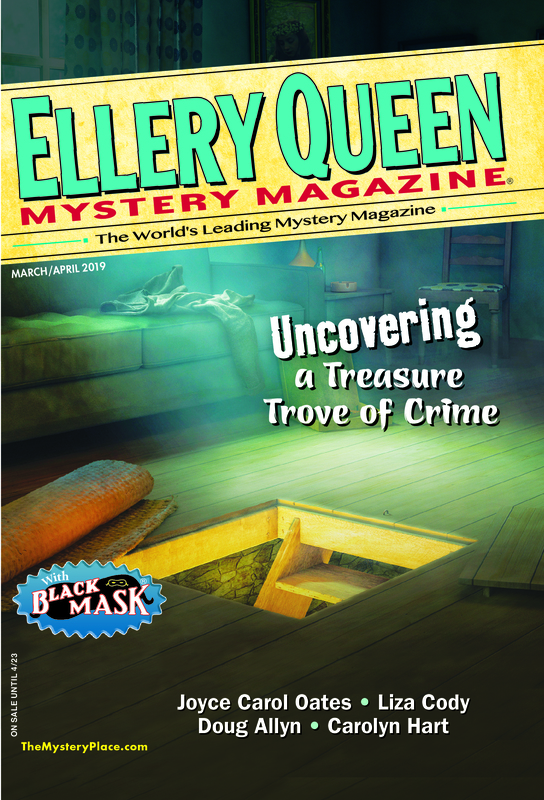 In December 2016, we’ll tie it all together with a final classic reprint from our archives and a look to the future, as I present a few of my own thoughts about what a magazine such as EQMM has to contribute to the literary scene going forward. We hope you have enjoyed all of the special issues already in print, and will look forward to those to come. But special issues are only a part of this year’s celebration. As previously announced, Columbia University will be presenting a two-month EQMM exhibition and an afternoon symposium in honor of the EQMM anniversary. Details of those events are on the two-page flier we are attaching below. Please come and join us for what promises to be a lively, colorful afternoon at the symposium and an exhibition that will include founding editor Frederic Dannay’s correspondence with some of the most important mystery writers of the twentieth century, as well as some of the manuscripts he edited and original drawings for EQMM’s early covers. A very exciting year! Thank you for so many wonderful issues. I look forward to the Symposium.